You spend a lot of important time in your dining space, make sure to complete it with something functional and stylish. This planked wood, trestle style table offers simple clean lines while having hints of trendy rustic style present as well. The two table leaves allow you to easily expand your table at a moments notice. The Armina Transitional Dining Table with Removable Leaves by Rooms Collection One at Rooms Furniture in the Houston, Sugar Land, Katy, Missouri City, Texas area. Product availability may vary. Contact us for the most current availability on this product. 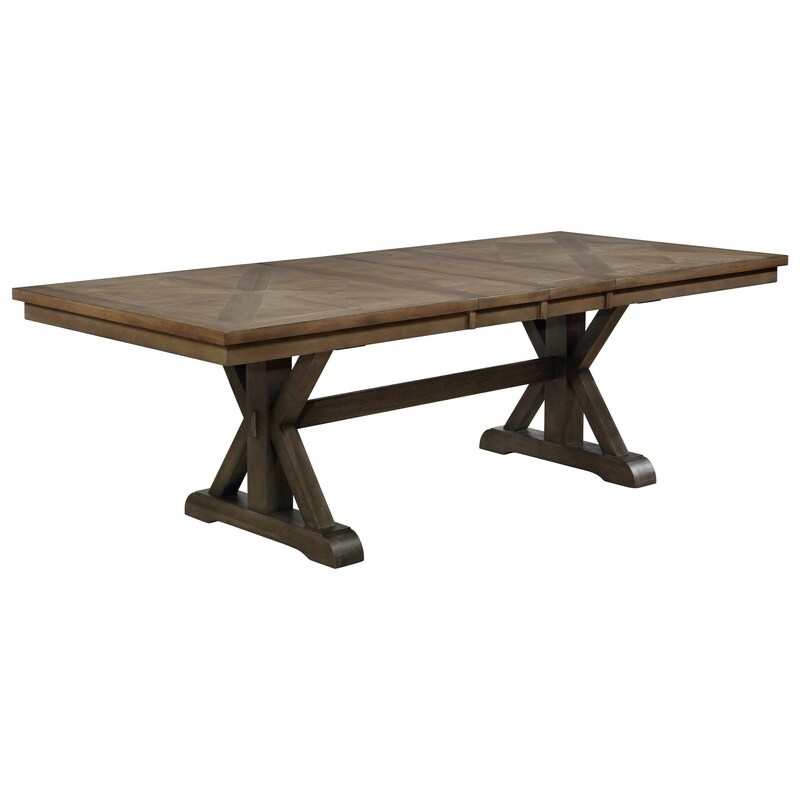 2296T-4296-LEG Leg For #2296T-4296-Top 1 0" 0" 0"
2296T-4296-TOP Dining Table Top (2X12 Leaf) 1 42" 0.75" 30.5"
Transitional meet rustic in this collection of dining room furniture. The plank wood designs with gray tone finishes combined with neutral upholstery offers a striking contrast that will bring warmth and sophistication to your dining space. The Armina collection is a great option if you are looking for Rustic Transitional furniture in the Houston, Sugar Land, Katy, Missouri City, Texas area. Browse other items in the Armina collection from Rooms Furniture in the Houston, Sugar Land, Katy, Missouri City, Texas area.